DetailsPerfect Fit every time! 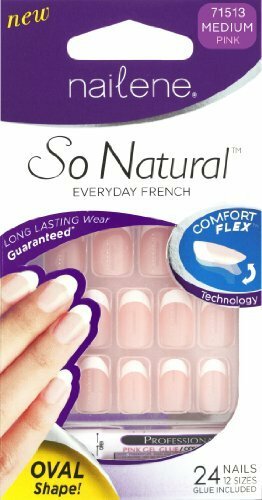 Our So Natural nails are made with exclusive Comfort Flex technology designed to fit most nail types. So comfortable, you won't even know they're on! Contents: 24 Glue On Nails1 Glue (0.07 oz)1 Manicure Stick1 BufferDirections1. Buff nail then clean. Push back cuticles. 2. Apply glue to artificial nails. 3. Apply glue to natural nail. 4. Press and hold. To Remove: Trim and file artificial nail. Soak in acetone polish remover until artificial nail dissolve. Do not break or peel off nails. WARNINGS:CYANOACRYLATE BONDS SKIN AND EYES IN SECONDS. AVOID CONTACT WITH EYES, MOUTH AND SKIN. KEEP OUT OF REACH OF CHILDREN. Avoid contact with clothing as can cause burn. Do not use if nail is inflamed or infected. Eyelid bonding: See a doctor. Skin bonding: Soak in water and ease apart gently. Do not force apart. If you have any questions about this product by Nailene, contact us by completing and submitting the form below. If you are looking for a specif part number, please include it with your message.